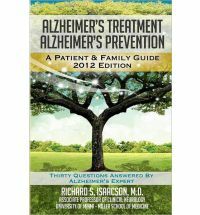 Harvard-trained Neurologist Dr. Richard Isaacson answers the most common patient and caregiver questions on the treatment and prevention of Alzheimer’s disease (AD). He shares his cutting edge, comprehensive approach in the fight against AD, the greatest public health crisis facing our world today. This groundbreaking book has been written especially for patients, caregivers, family members, and allied healthcare professionals. Dr. Isaacson answers questions in easy to understand terms to help educate and inform those confronting AD. The book can be used as a resource to empower families to understand the latest treatment and prevention strategies. In 2011, there is more hope now than ever in Alzheimer’s disease. Dr. Isaacson answers questions about AD easy to understand terms in order to help educate and inform those confronting the disease. The book can be used as a resource to empower patients and families to understand the latest strategies in the fight against AD. Remember: Knowledge is Power – Get informed, Get Educated. The fight against AD is a battle we must win.